The wedding ceremony is a public declaration of the love of two hearts. The tradition of exchanging wedding rings is well-celebrated one that brides and grooms look forward to every year. The simple symbol of an unending circle perfectly expresses the commitment of husband and wife to love each other for a lifetime. But choosing such an important symbol isn’t easy. The wedding rings should reflect the style and personality of the couple, and be made to last. Thankfully, one online jewelry retailer makes the most of every wedding ring search: Apples of Gold. Their selection of wedding bands is exquisite, particularly their collection of heart shaped wedding rings. These specially designed rings make for a beautiful display of affection that will last a lifetime. The heart motifs are a romantic nod to the bride and groom, and Apples of Gold offers plenty of beautiful options. The Celtic Heart Wedding Band in 14k white gold is one of these wonderful choices for heart shaped wedding rings. 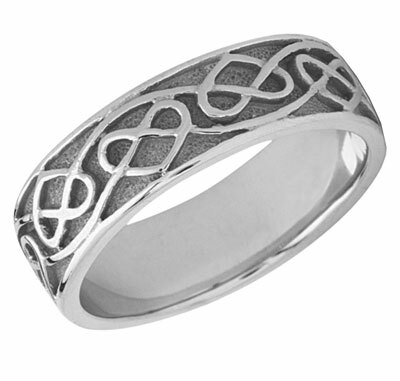 Cast in 14K white gold, this creative ring channels the beauty of the Celtic heritage in an expertly crafted band. Hearts are knotted together and woven across the center of the band for a continuously beautiful pattern. Two edges of white gold frame the design and make a 7mm wide band the perfect fit for any couple looking to put a little bit of love in their wedding bands. Another of Apples of Gold’s heart shaped wedding rings is the Artisan Heart Etched Wedding Band in 14K two-tone gold. 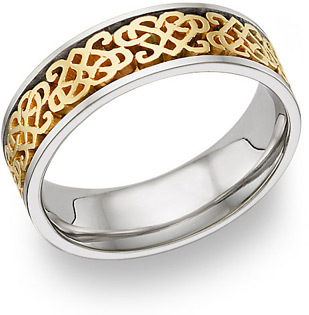 This wedding band features perfectly carved hearts that swirl over the band. Filigree details accompany the hearts and make this a gorgeous and intricate pattern of 14K yellow gold that casts the perfect golden glow for years to come. 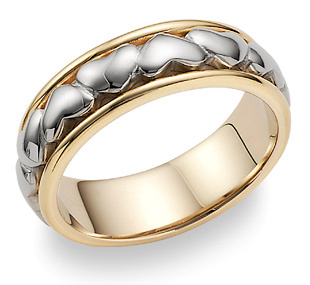 The outer edges offer a lovely contrast in 14K white gold and lead to the inner band of the same color. The 8mm etched band is an absolute winner for the couple looking for a refined work of art for their wedding ceremony and for their lifetime. One of the heart shaped wedding rings that features a radiant white diamond is the Floral Heart Diamond Wedding Band in 14K white gold. A single heart defines this ring in the center and is set on either side with two sweeping vine-shaped branches. Two small flowers rest under the vines and adorn this ring with the best in floral beauty. This exquisite piece is perfect for the blushing bride to wear for a lifetime of whimsical romance. Heart shaped wedding rings go hand-in-hand with the beauty of rose gold. This Apples of Gold creation is one rose gold ring that will win hearts over again and again. The Heart Wedding Band in 14K rose gold offers a subtle pink color with all the value of a precious metal. The inner band features a comfort fit design to make all the luscious hearts a breeze to wear. The edges of rounded rose gold provide excellent framework for the full hearts that line the center of the band. These gorgeous shapes will always remind the bride and groom of their eternal love. The heart shaped wedding rings from Apples of Gold offer the perfect mix of charming design and high quality craftsmanship to keep any couple happy with their purchase throughout the years. The heart shaped motifs are a unique and beautiful touch to the wedding ceremony and will give the bride and groom a truly romantic feature for their ring exchange. Apples of Gold’s wonderful selection of heart shaped bands makes finding the right ring as easy as giving your heart to the one you love.